This could be one of the most pivotal action figures to be released in decades. A bold statement, I know, but let me state my case. As modern toy/figure collectors here in the US (i.e. not Japan) most of our collecting options come in the form of low-cost toys that are either children's toys made with an eyes towards collectors, or "collector's toys" that need to comply and also sell to children. Either way, there are not very many action figures out there that are made directly for the adult collector market. We here in the US are flinch at the thought of buying an action figure that breaks the 10-25 dollar barrier. In Japan-- which is far ahead of us in the quality of their action figure market-- collectors are willing to pay for the quality that the companies produce. Because of this, Japanese toy manufacturers are not bound to limiting things like articulation, paint apps and accessories like we are here in the US. In Japan-- much like Hot Toys does with their 12" figures-- they make the best version of that figure possible, and then simply charge the appropriate price. What Mezco is attempting here is to shatter the "big box store" mold that companies like Hasbro and Mattel must adhere (and DC Direct and Diamond/Marvel Select self impose) and make the best possible figure-- with a second head, all the appropriate hands, a stand and accessories-- all the best possible articulation-- and charge what they need in order to bring that figure to market. What also make this figure ground-breaking is the cloth costume. We have seen this used to varying degrees of success with 8", Mego-style figures, and to greater success with 12" figures, but in a 6" scale-- done this well--well, that's something we've never seen before. 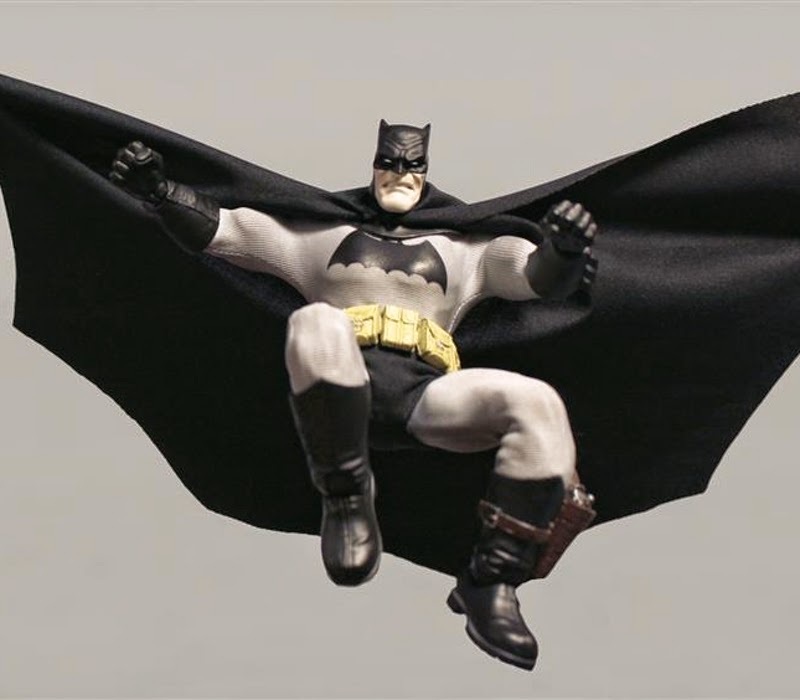 So Mezco wants to bring us a true action figure, with a cloth costume and additional hands and figure posability. They're taking the best of every scale and every part of US and Japanese action figures, and putting it all into one figure line for the very first time. Can you imagine what could come next (aside from the Judge Dredd and Universal Monsters they have planned) if this series-- and style of figure-- is successful? While Marvel Legends is affordable and are nice looking retail action figures, what if Mezco is the first company, taking the first step, to bring adult collectors high-end action figures based on pop culture icons. Imagine Mezco getting the license to Marvel, or DC or Star Wars. 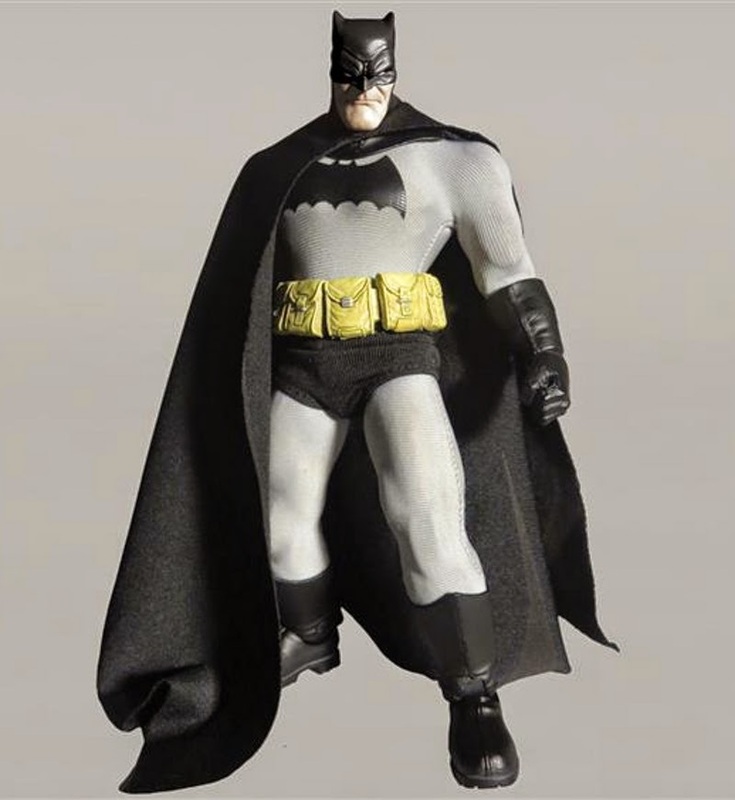 Imagine if companies like Mattel and Hasbro saw that the adult collector market was a viable place to make money because we were willing to actually pay for high-end figure like Mezco's Dark Knight Batman. I truely believe what Mezco is doing here is as ground-breaking and game changing to the 6" action figure market as Hot Toys was when they revolutionized the 12" figure market. So, are you willing to pay to support a line like this? (The figure will sell for around $70.00) Or are you happy enough with the hit/miss style of figures that companies like Hasbro gives us in the 6" "collector" scale? 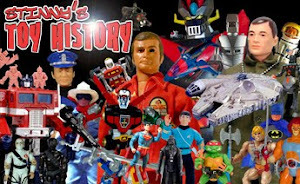 I believe that-- along with the independent company/direct-to-market figures like Boss Fight Studios' Vitruvian HACKS line--if we as collectors hope to have product in the future that fits our standards and needs as adult collectors, that we need to look beyond and outside of the ever shrinking retail store action figure market. Retail sales are getting worse and worse with each passing year, and in time, companies are either going to finally focus all of their energies on the kid market or simply stop producing action figures all-together. As a community, we must find new avenues of action figure collecting from companies who are willing to stand up and acknowledge our presence until the "Big Two" do as well. 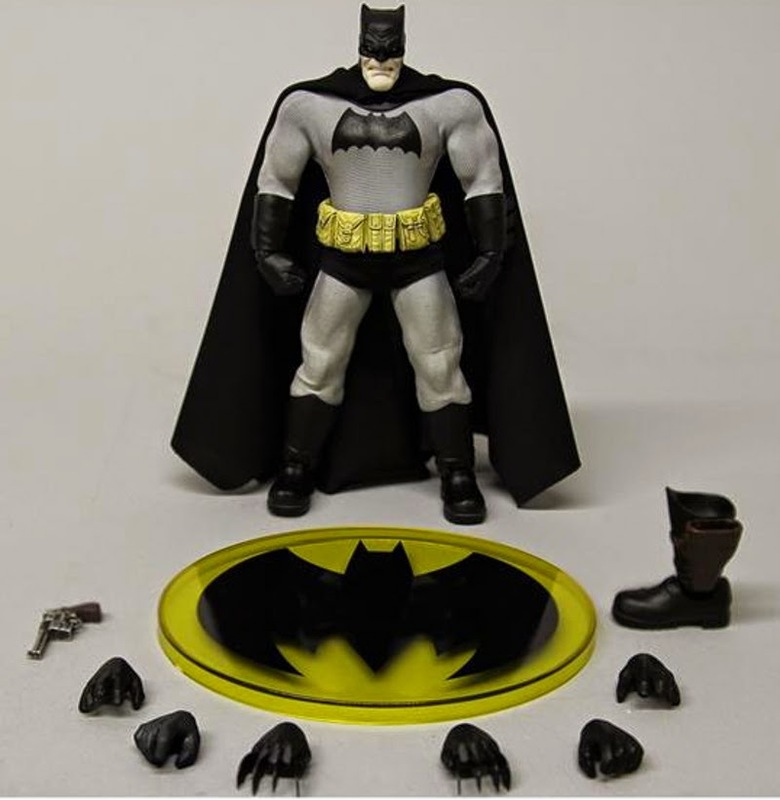 Mezco showed off two other versions of Batman from DKR, one in dark blue, the other in light blue, so I'm sure those will be coming as well. I must say...I'm a little skeptical. Or should I rather say...hesitant. Although I admire this figure and all his goodies...aside from the cloth accessories, I question its price point. Im not going to argue its worth, but it begs a comparison. If I look at what companies like neca do with an $18 figure, my head explodes when I think of THEM making a $70 6 incher. I foresee Batman taking the place of all those 14 inch Mezco Thundercats. Amazingly detailed figures in their own right...with a somewhat ridiculous price, that ultimately found themselves banished to clearance sections and ebay 'take me' sales. Ambitious by Mezco...YES. Over ambitious...MAYBE. Will it push companies in that collector direction like you mention...I HOPE. I'm definitely one to shell out cash for a great high end figure, I just don't know if this is the one that will bridge the gap. 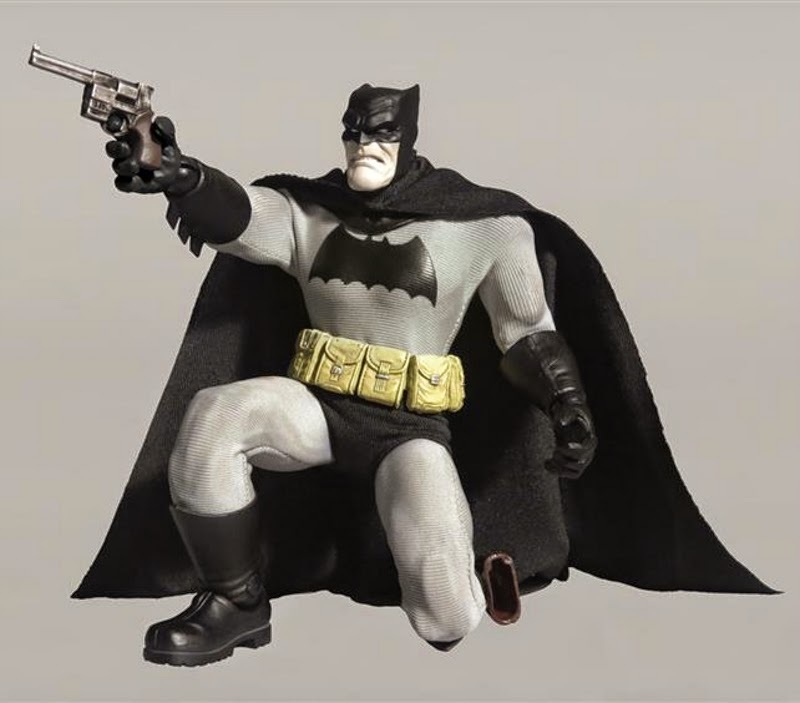 Valid points and I understand your skepticism, but I feel like someone, somehow, needs to start the charge towards creating true high-end action figures in the US market, and if Mezco plans to be the first to step up and do it, then they, at the very least, have my attention. And yes, a $70 6" figure from NECA would indeed be mind-blowing, I'm sure!